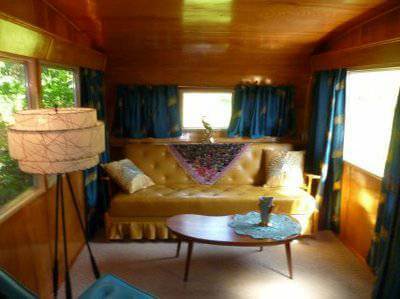 The original small home has always been, and will always be, a vintage mobile home. Design is a bit different, of course, but the overall concept of a ‘small home’ is the same: A fully equipped home within minimal square footage that can be towed without specialized equipment. 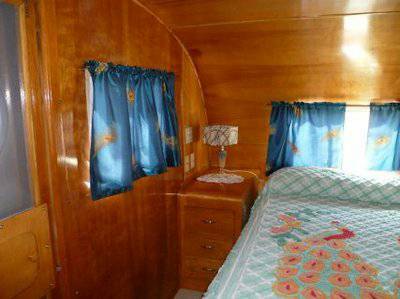 Here’s one of the original small homes, a 1953 Silver Star, in all its restored vintage mobile home glory! In 1953, an average household income was around $4,000. A new site-built home cost just over $17,000 and a new Ford to park in the driveway would run you between $1,500 and $2,500. 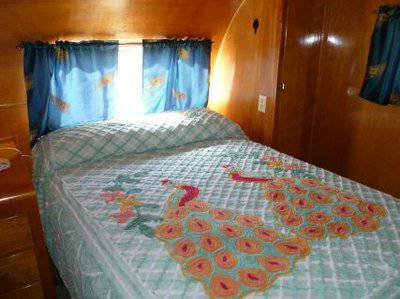 A top-of-the-line mobile home only ran between $3,000 and $6,200. What a great deal! 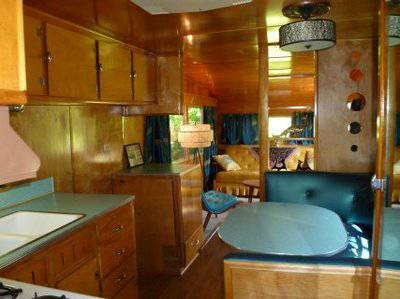 From what I could find, the Silver Star was a home manufactured by Star Mobile Homes. The umbrella company was based out of Union City, MI and produced several well-known mobile home brands such as Duo, Elcar, Kozy, Pan-American, Terra Cruiser, and the innovative ‘M’ System. 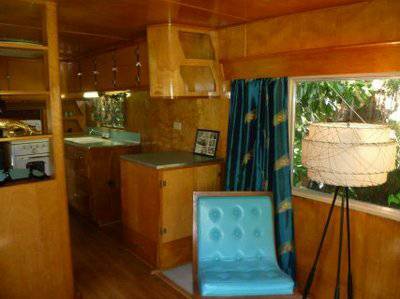 The exterior is great on this restored vintage mobile home but the real jewel is the interior. Related: The Vintage Camper Fad is Awesome! 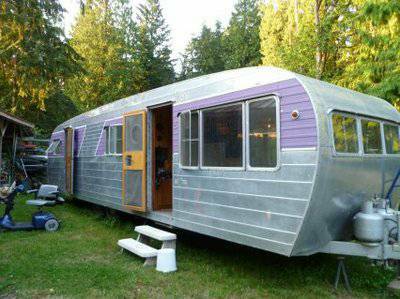 The original small house , this is a 35′ 1953 vintage Silver Star camper. Updated electric, plumbing and new air conditioner. All the wood interior and windows are original restored. New wood flooring and carpet. New upholstery, curtains and counter tops. Original screen doors and lighting fixtures. 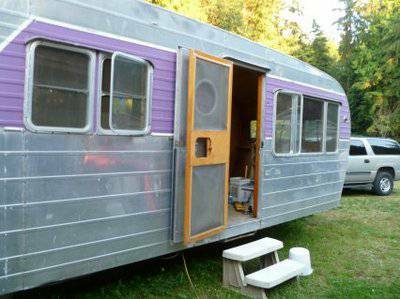 This is an extremely cool old camper with porthole windows in the doors and the vintage stove / oven works great. Ready to enjoy or just show off. Used her at the lake from time to time. 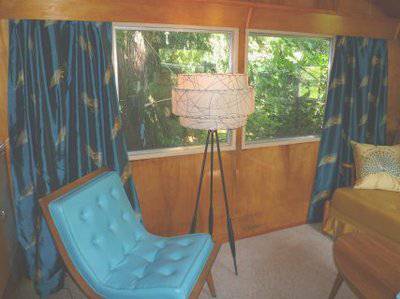 Even the furniture is period perfect for a vintage mobile home! Not only is the interior in perfect condition, the features in this home have been carefully matched to closely resemble the originals. The light fixtures, counter tops, stove, and sink are all perfectly restored. 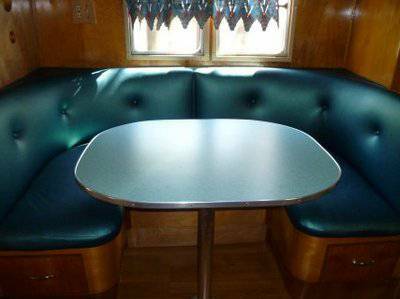 The dinette seating is beautiful. 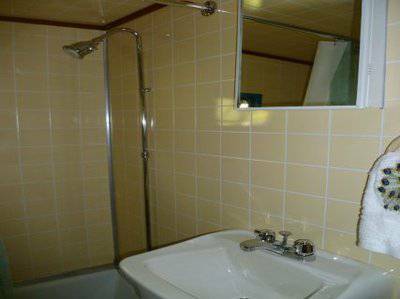 The bathroom is in great condition, too! 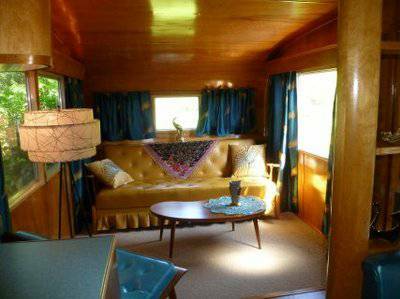 I love this vintage mobile home because it was carefully restored by an owner that obviously understood the early 1950’s decor. It’s a simple, yet ultimately sophisticated, home that should be cherished for years. 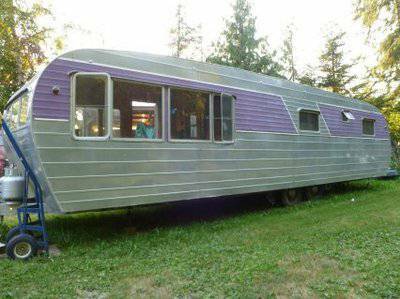 If you are interested in this vintage mobile home please click here to be taken to the Craigslist ad. Please note that I have not communicated with the sellers at all and have no association with the home. Those split rims are a pain, huh? I’d love to see your camper – could you email me at [email protected]. Thanks! as well as the make/model/year It was an 8×35, as I recall. Can you help? I’m not really knowledgeable about Silver Stars but I’m sure someone reading your comment can help! My mother-in-law owns a 1956 Silver Star mobile coach located in a campground. We are unable to find the title and are looking to find the serial # – do you have any idea where we might find it? Many thanks for your help. Please e-mail me your reply. Hi Crystal; I have been a fan of your site for a long time. You mention Kozy above; I assume you mean Kozy Koaches. Kozy also had a sister model called a Silver Dome. I have a 1947 Silver Dome that we are going to restore. It still has the original lamp shades in the bedroom, glass fronted kitchen cabinets and little tub in the bath room It even has the original refrigerator, that was still working when the trailer was last parked. From looking at other models, it seems the main difference between the Kozy and the Silver dome is the polished aluminum top on all the ‘Domes’. We lived in a 40′ (37.5 actual floor space) 1943 2 bdrm for many years. I loved that trailer. 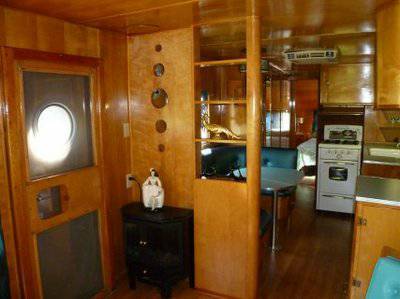 It was identical to the long long trailer but had an over sized bathtub, roomy and plentiful metal kitchen cupboards, a built in curio cabinet and beautiful curved wooden valances on the windows.It had a walk through bedroom with closets along the whole wall, then the bath room and a rear master bedroom. The bathroom was set on a raised platform and the water pipes from the kitchen to the bathroom were all inside so they never froze-even when it got well into the minus’s. I have forgotten the model, but the exact same trailer (except it had a rear bathroom) was the trailer used as a dressing room by Marilyn Monroe when making the misfits. Hers had the same valances, curio cabinet and metal kitchen cabinets as ours. It was on display for a number of years in Reno Nevada. The movie was filmed in Stage Coach Nevada, about 40 miles from Reno. I am so happy to see you don’t make the mistake so many do in confusing old travel trailers with with old house trailers. 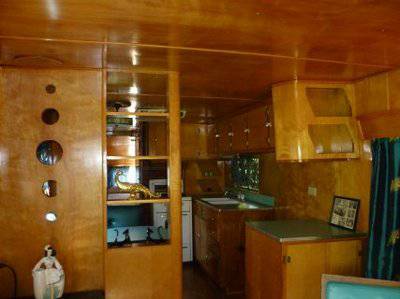 House trailers never had holding tanks and rarely had dining booths. 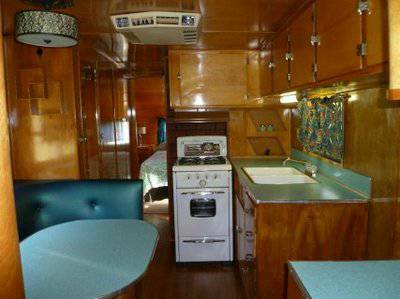 Although the very first travel trailers didn’t have holding tanks either, they usually had a dining booth that converted to sleeping and a bed on the ends with a little kitchen in the middle. Then the travel trailers added water tanks with a hand pump, but house trailers never did. They were always designed for a hose hookup and a sewer line. Our old trailer was one of my favorite places to live in.Probably the best organized and useful space I have ever lived in. Unfortunately we bought property where we weren’t allowed to live in it. We parked it, but later we moved to another property and left the old trailer on the property we had vacated but still owned. It was so badly vandalized I doubt we will ever restore it. We currently reside on a remote ranch and our house is a 1963 modular (which means a mobile home that was set on a foundation and the axles were removed) double wide-20 x60 with a 20×30 2 story addition. We didn’t know it was a modular until we had a plumbing leak and crawled underneath and found the metal chassis. This house is so big that I find myself longing to get back into another old 8 wide. The silver dome is really too small-its only 19 feet. However we have another old 40 footer that is in slightly better shape than the vandalized trailer, but not nearly as well designed and appointed. Who knows; maybe one day soon I’ll be sending pictures of our project trailer. It’s always a treat to get to hear first hand about a particular model. All the photos in the world can never quite convey what the homes were truly like! I hope to hear from you lots more! So glad I came across your site and information! Not sure why, but I dream about remodeling a large mobile home. I almost purchased a 14′ X 70′ Windsor recently, but decided to wait a bit. The home is still sitting on the lot where I reviewed it. Perhaps some day… Very curious on how you became interested in mobile homes. We bought a 1978 single wide four years ago. I searched online for remodeling and decorating ideas and didn’t find much so I started this blog. From there I went down the rabbit hole and haven’t quite managed to find my way out! The more I learned, the more obsessed I became…lol. Hope you get to remodel a mobile home soon! Best of luck! Thank you for answering so quickly to me about routing pex. It was very helpful along with other homework I did. I now know how I will do it. Basically you build a frame, or lip, for the tub edges to rest on, just like you would a site-built home. The only difference is the size really and where your drain may be. 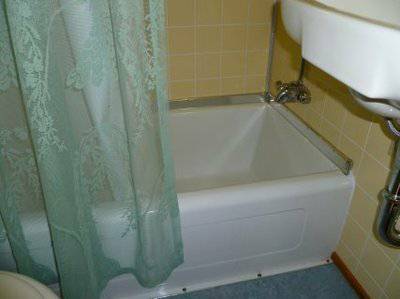 Here are some results from Google for replacing a bathtub in a mobile home – that should get you familiar with the process.